singled on a 1-2 fastball. Following a called ball on a 0-0 pitch to ensuing batter Chris Dickerson, Fairchild warned Martin as manager Clint Hurdle came out to discuss. On his way back from conferencing with pitcher Leroux, Martin interjected and was ejected. Replays are inconclusive as to the quality of the 0-2 and 0-0 breaking balls, the call is irrecusable. At the time of the ejection, the Orioles were leading, 4-0. The Orioles ultimately won the contest, 12-10. This is Chad Fairchild (75)'s first ejection of Spring Training. This is the second MLB ejection of 2013. Martin, on Fairchild: "He's a good guy, I know he is. But I probably let my emotions get back to me, and I'm sure he did to. We both had our reasons and disagreements. It was frustrating. I'm really just treating it like it was a regular-season game in my intensity and the way I go about it." Leroux, on Martin: "I'm just glad that he kind of had my back. I'm glad he noticed the same things I noticed." Hurdle, on the situation: "[Martin] thought there was a whole bunch of pitches that we had strikes on, that we weren't getting. I wasn't going to shut him up. He's got as good of a view, if not better than the umpire, because he's set up right behind the plate. He took a stand for his men. That's good to see. I have never in 39 springs had to replace a pitcher and a catcher in the top of the first inning with one out. Never seen it. Never been a part of it. Never watched it ... It just got to the point where sometimes all you can do ... to be quiet just isn't acceptable. It's happened to me during the season. You're just not going to walk away. There comes a point in time where you just don't walk away. [Martin] didn't want to walk away." Video: Martin won't let it go; Fairchild ejects and tells him, "that pitch was outside and you know it"
Top of the first inning, four run game... yeah, that is DEFINITELY the home plate umpire's fault without a doubt. Martin just wanted to catch some March Madness - must have money on the Tar Heels KU game. Pitch certainly looked out. 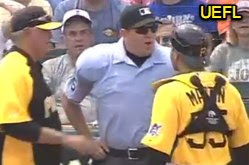 Figures that Martin was unhappy with some of the calls, and Fairchild had told him enough of that. Hurdle comes out, and Martin reignites the same conversation. Then, Chad whacks him. No problems here, folks. Haha. I love spring training. Russell "what did I do to get run?" Martin angrily goes back to his dugout yelling and pointing all the way then calmly exists the back end and jogs down the right field warning track into the corner off the field where the clubhouses are. Did anyone else see Clint Hurdle do one of those in game interviews shortly after the EJ and try to say it was all Chad Fairchild who caused the problem? His post-game comments seemed to reflect a similar sentiment.